Long-running syndicated court show Judge Alex has been cancelled. The cancellation was confirmed by Stephen Brown, executive VP of programming and development for the Fox Television Stations. 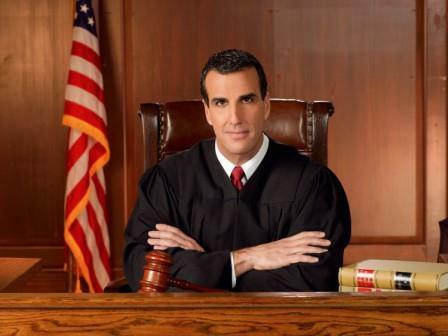 Judge Alex debuted on September 12, 2005 and features cases that are presided over by Judge Alex E. Ferrer, a former police officer, lawyer, and Florida judge. The series is the lowest-rated of the five remaining court shows and will continue airing original episodes through August. He also hinted that he may return to television at some point in the future. What do you think? Did you like Judge Alex? Are you sorry that it’s been cancelled? More about: Judge Alex, Judge Alex: canceled or renewed?, Syndicated TV shows: canceled or renewed? Judge Alex was the best. I watched him everyday now I don’t remember the last judge show i saw. Really wish he would come back on! I loved Judge Alex. I heard that a Court TV is starting soon. I hope it is him. I just realized that court TV is reality TV. In general I don’t care for reality TV, but I do enjoy court TV and Judge Alex was one of my favorites. I don’t get to watch TV during the day, but I hope Alex comes back in something sometime soon. In view of his considerable background, has he considered dramatic acting? Just a thought – I know, he probably considers that ridiculous. Anyway, I really liked his style of justice. ITS ABOUT TIME THAT A PROGRAM LIKE THIS HAS SURFACE. I am a real estate broker since the last 70’s and the the things I am seeing now, it won’t take long until you have a lot of stories . I got into a truck accident, and I can’t believe how all these attorneys and doctors are conspiring against the the plaintiffs and the defendants. And all the barratry going on, and the public has no idea what is going on. I am fixing to sue several attorneys and a doctor very soon. I think they forgot about their FIDUARY RESPONSIBLE. We watched your program every day – so much more entertaining & on point than many of the other judges. We have been looking for you, channel surfing looking through different channels & time slots. Never thinking that your show was cancelled. Looking forward to the day you return !!!! He was one of the most respectful and fair judges on television. He was capable of joking without denigrating the litigants. I loved his manner. He was one of the most even tempered judges on T.V. Unlike Judge Judy whom behaves like a rabid dog most of the time. Totally agree with other responders. Most fair but firm judge show on. As an added bonus, we nicknamed him Judge Candy. Yet down to earth. Sure wish he would return. It’s a damn shame the only court show I even liked to watch. Judge Alex had class. He treated his witnesses with respect and has a certain charm that made his show wonderful to watch. I miss him and want him back. I think the producers had a colossal nerve taking him off the air. I truly miss his show. I hope he returns.